Well I hope you enjoyed the Advent Calendar! It was definitely fun to make and search through the youtube videos. In honor of the new Harry Potter title coming out, I leave this Christmas Countdown with a fabulous Dumbledore quotation as well: "I see myself holding a pair of thick, woolen socks." Harry stared. "One can never have enough socks," said Dumbledore. "Another Christmas has come and gone and I didn't get a pair. People will insist on giving me books." --"Harry Potter and the Philosopher's Stone"
I cannot believe I found this. It is simply perfect for Christmas Eve. Now keep in mind, it is not the most accurate depiction, but it is meant in all good knitted fun. Enjoy! I hope you are having a happy holiday season! Sorry for the lateness, when I am at home I have to fight for the computer! I am sure you have seen/heard this story before, but it continues to amuse me. In just a few hours I will be airport bound! I have decided on my two holiday knitting projects. I am bringing along Argosy and Glaistig (well they are currently in the conception phase). These two projects are the two most unlikely projects for me but nevertheless I have become attached to them. In the case of Argosy, I took one look at this scarf and decided I needed to knit it. At the same time, a voice in the back of my head kept saying, "but SAK, it is entrelac! Are you ready for entrelac?" Well somehow I was able to ignore this voice, neglect to read the word entrelac in the intro, and somehow ignored the repeated mentioning of casting on during the course of the project. After falling in love with the project, the instructions came into focus and I realized that yes, entrelac is required. When I saw this, I could only mutter, "the things we do for love." In regards to Glaistig, my first thought was, "now that is an interesting and quite unusual hat." These are not the words of someone who would knit this hat. Recently, however, I looked at the hat again, and it began to grow on me. I noticed that I had the needles and the yarn suggested and something in me shouted, "the cabling doesn't look too bad! Let's do it." It is these random and illogical statements that get me into trouble all the time. At this point though, I must at least attempt to cast on for these two projects. Another tale of knitters and crocheters and the great divide. This movie is a bit slow, but worth every minute of it. Okay, I don't normally post my responses to online quizzes (because what is the need to brag that I was sorted into Gryffindor House or I am Optimus Prime), but I found this response particularly amusing and felt the need to share it with all of you. I am not sure how "The Midas Touch" equals seduction style, but the rest of it is entertaining. Phew, I think I am officially done with "stuff" for the semester. Yes, I still need to go to lab and yes, I still need to see participants, but I think I finally have time to sit and watch Christmas movies (Rankin & Bass I are tight!) and Christmas shop and maybe answer some email that I haven't really responded to in...months. Hey! I have been busy! Okay, I have issues regarding responding to emails and phone calls...I am sure Freud would say something about an intense fear of rejection or something...note to self: never psychoanalyze yourself...::shivers::. I haven't seen a Pee Wee Herman movie in a while, so I don't know the context of it, but it is just amusing and I don't know why. Nascar knitting! I love it! I hope you are enjoying the youtube video advent calendar. You won't believe all the crazy stuff people upload. Also, if you are having trouble knitting backwards, forwards, or any combination in between someone has made a video to explain it to you. There is even a video of someone knitting Icarus. There is no sound and all you see are the needles knitting away. Youtube is a crazy world. Sheep are cute. That is all. When I was watching this, all I could think was..."when fun fur attacks!" The girls in my class and I made a run to the Waldo Flea Market on Sunday. If you live in the nearby Waldo, Florida area, you must go. It is just about as much fun as one can have on a Sunday in the Gainesville area. I am not sure if that is saying much, but it is fun. 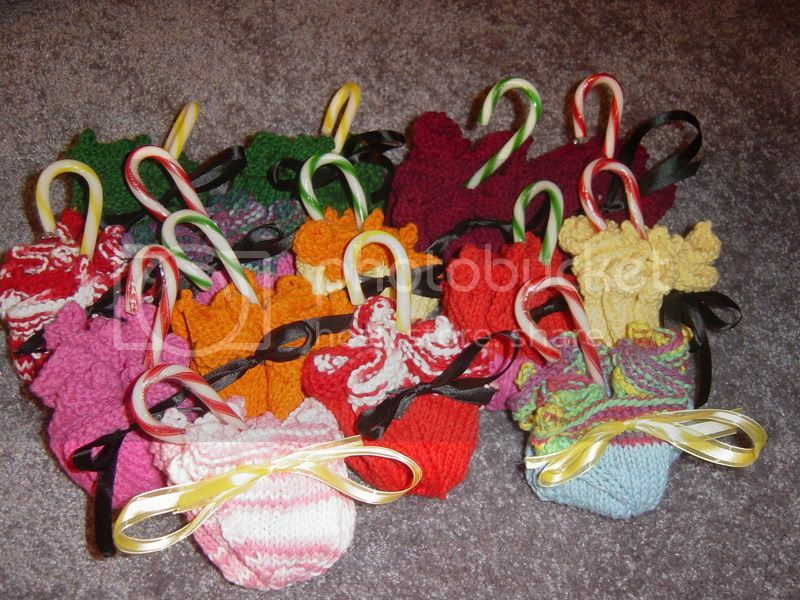 Anyway, the reason I am mentioning this is because I got Knit Mittens! for $3 at one of my favorite book tables at the market. I could have also gotten Knit Hats! for $3 too but there are some fugly hats in there so I ignored it, which is sad since I like to knit hats. Enjoy! (Is it just me or is everyone else putting off their holiday knitting? Here is a ditty from the Electric Company (found on youtube). Hope you enjoy it! Hurrah! It is December 1st and you know what that means! The holiday season is upon us! I thought it would be fun to turn my blog into an Advent Calendar of sorts. Tune in every day from now until Christmas for a fun and random knitting event! This is a video I found on youtube. What could be a better way to start the holiday knitting season than with a video of men who knit? Enjoy!